As the 20th Century scrapes to a close, two veterans of the SoCal music scene, Jake “The Preacher” Cavaliere and Johnny “Stiggs” Devilla (whose mutual musical pedigree includes The Fuzztones and The Bomboras, and individually namechecks The Finks, The No-Counts, The Morlocks and more) are looking to start something new; something more down and dirty. Leaner. Meaner. Louder. Focusing their garage punk roots in an entirely different direction, and taking into consideration the impending death of the present century they look back to another dark period; the final nail in the coffin of hippie culture. Altamont. Already experienced riders themselves, keyboardist/singer Cavaliere and guitarist Devilla set about re-inventing biker rock for the new century, pumping it through a garage-punk filter and pushing everything into the red. 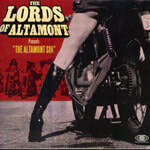 Roping in fellow former Fuzztone axeman Gabe “Martian Boy” Hammond, occasional Cramps bassist Doran Shelley and drummer Max “Sicko” Eidson, and taking inspiration from one of the most iconic events in pop culture history, they immediately invite controversy by dubbing themselves The Lords Of Altamont. The original lineup, which would come to be known to their fans as “The First Five,” kickstarted a new generation of garage-biker rock with their first show at the legendary Hollywood venue The Garage in early 2000. That show was the spark that led to a wildfire as word of their shows spread and The Lords of Altamont became something of a global underground phenomenon. They were the band other bands would come out to see; their live performances described in almost reverent tones and their records consistently garnering acclaim. Early 2002 saw the release of their debut LP, To Hell With The Lords Of Altamont (SFTRI), which brought their 30-weight gospel to the masses in all its overdriven glory. But by then the personnel had begun to shift and Shawn “Sonic” Medina had replaced Doran on bass. Despite numerous personnel changes the flow of albums and singles – as well as tons of touring - continued. Lords Have Mercy (2005) saw the band finding a semi-permanent home with Gearhead Records, who continue to release new Lords records today. Altamont Sin followed in 2008 and, like clockwork, three years later, Midnight To 666 was released in 2011, with various singles and an EP (On My Mystery Plane) sprinkled across the timeline. No matter what upheavals in the lineup, and there have been many, every recording that bears the Altamont name consistently oozes loud and sweaty rock and roll from every groove, and the band continues to play for fans around the world. High points have included touring as the support act for their primitive rock n roll idols The Cramps, opening for The Who, and counting the late Michael Davis of the MC5 as a past member. 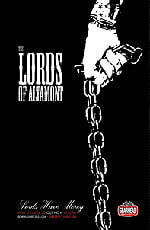 Lords Take Altamont, the band’s new album, reinforces just why their fuel injected, fuzzed-out overdrive has garnered them such a diehard fanbase. As subtle as the sweet sweet crack of a pool cue on Marty Balin’s pompous hippie head, the band shows no mercy with a blistering set of songs all originally performed at Altamont; all channeled in their inimitable gritty, primitive style. Jake, along with Dani Sin (guitar), Rob “Garbage Man” Zim (bass) and Harry “Full Tilt” Drumdini (drums) celebrate the band’s 15th Anniversary on this special release with guest appearances by almost a dozen former members as The Lords pay homage to the event of their spiritual birth in vicious, savage and uncompromising fashion. Like the roar of a tailpipe you can hear from blocks away, the band takes classics by Jefferson Airplane, Santana, the Flying Burrito Brothers, CSN and, of course, the Rolling Stones and re-imagines and re-interprets them as only they can for maximum sonic impact. It’s 666% pure power, baby, so climb on board for the long, loud ride. Spring 2014 update: The Lords welcome a new skin basher to the fold as Detroit native Tom “F.T.F.” Hernandez (ex-Superbees and Peachfuzz) takes over the drum chair, bringing in a healthy dose of Motor City swagger.